Earlier this month, and to the dismay of many, Netflix canceled Sense8 after two seasons. Fans were already concerned that it would get the ax and when it actually did, they were having none of it. They pretty much immediately voiced their opposition, a worthy effort considering Timeless was brought back following fan petitions. But, outcries from Sense8 fans couldn’t save the Wachowski siblings’ sci-fi series. Even considering the strong support, Netflix announced that they still can’t make Sense8 work. A letter was posted to Netflix’s Instagram, saying that they’ve seen the petitions, are aware that fans were pulling for a renewal, and that they wish they could bring the show back. But, in the end, they said they can’t make it work, and thanked fans for watching. 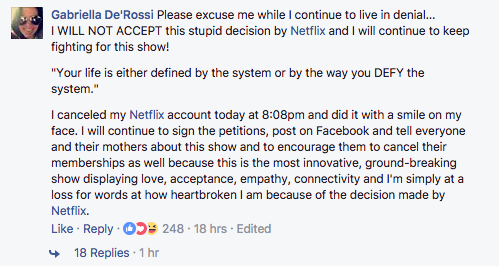 The letter was also posted to the show’s Facebook page, and fans did NOT take it well. Outrage continued in the comments on the post, ranging from disappointment that they didn’t get a resolution to the series to pleas for a movie to wrap things up. Some even canceled their Netflix account in protest. Sense8 is just one of a handful of Netflix shows to be canceled recently. The Get Down, Bloodline, and Marco Polo also got the boot, so if it’s any consolation, Sense8 fans, at least you aren’t alone — and there’s always hope that another streaming service or network could pick it up. Fingers crossed.